Mikki. Tomato (it's a long story). Mikki-Mayto. Muppet. 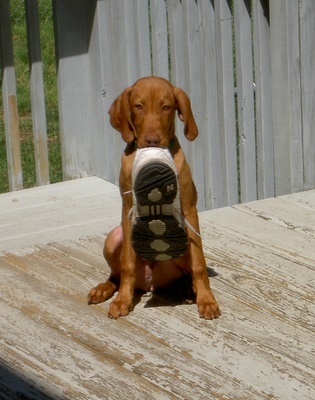 This puppy answers to all of those names, and a few more. 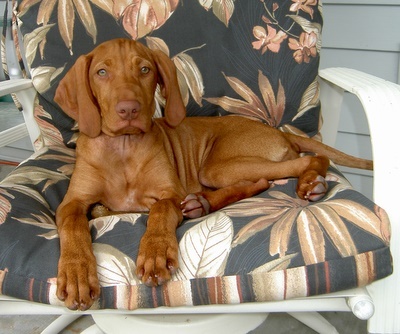 Mikki came to us from our friends Skip & Laurie Wonnell of Remek Vizslas (www.remekvizslas.net). Mikki is currently enjoying Beginning Agility with Randy, a new area of interest for him. A quick learner, Mikki is taking to it like a natural. Randy is working on learning a whole new skill set and looking for ways to improving his timing and handling skills for the field, as well.